The author of The Prophet was born on this day in 1883. Do you agree with the above statement? I thought about it and came to the conclusion that I often speak when I am at peace with my thoughts. Don't we often speak to comfort others, to teach our children, to enjoy conversation with a loved one, to get to know a new friend? Even speaking to ourselves can be comforting, especially because we can get just the answers you want. I remember one day when I was growing up, I was upset about something and closed the room to my door. After a while, my father knocked on the door and asked if I wanted to talk. I have thought about that episode many times. Maybe because I rarely get upset, but most of all because I felt my father was wise and loving when he invited me to talk with him. The written word is also a way of talking. And a fun and satisfying way that is. I have two porcupines that I place on a manuscript to keep the papers from flying off. It's a mother and child and they don't only serve as paper weights, but give me good feelings as well. 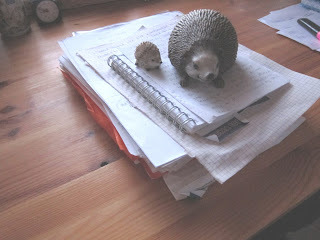 Arnfinn looked at them one day and named my pile of papers "The Hedgehog Chronicles". The poor man is definitely under the influence of a woman who names things around her and even speaks to them. But I loved the name - and it will stay.